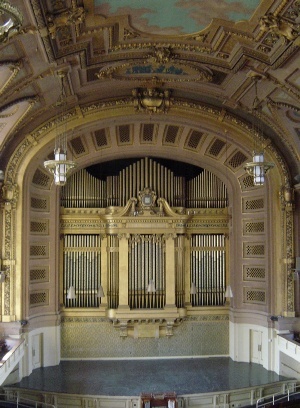 I had a recital to prepare in Woolsey Hall at Yale. In those days students were given only very limited access to the pipe organ, one of the most famous in the world, in that hall — even when we had a performance coming up there. Great planning and discipline, if we were wise, went into how our few hours of access would be spent. Thus I was particularly annoyed during my last practice session when there arose one of the organist’s occupational hazards: Someone was lurking at the very edge of my peripheral vision and wouldn’t go away. I know it makes no sense that, while practicing in a vast public building, a performer should be annoyed by the presence of a single auditor, but so it was. And I was far from unusual among my peers for finding it so. The organist’s lore is full of methods for chasing these people off (one of which is by playing the same dull passage over and over till the person leaves in desperation), but all of those expulsion techniques are time-consuming. And time was exactly what I was short of. So my grinning and bearing were called into overdrive when the figure came closer and closer and really seemed to bear down. I began to feel that a direct confrontation was called for, so I turned and looked the man squarely in the face. Before I could speak, he started asking questions in such a sincerely interested and noticeably intelligent manner, that I found myself answering him with, probably, no evidence of impatience. He wanted to know about the piece, which he was clearly finding to be of some fascination. So I recited for him a brief sort of program note on its composer, Max Reger, on late-Romantic organs and organ music, and on the passacaglia form that the piece involved. Some of this I could tell he already knew, and I slowly began to form a reluctance to go on with my little lecture. This was because, with a mixture of pleasure and horror, it was dawning on me that the person who stood before me, the person I had been trying to chase off, the person I had been on the verge of condescending to, was Edward Kennedy “Duke” Ellington.